PinkPurlGrrl: Has anybody seen a green and black hat? Has anybody seen a green and black hat? Green & Black Hat - part The Third. This most recently started green and black hat is a step in a slightly new direction; I designed the color pattern myself. I like the color flow found in many Fair Isle patterns (lighter to darker and back in one color family), and I like the joined patterns you see in Latvian patterns - so I combined those elements in this hat. I don't like the first row of crosses where I alternated with solid and open, so I'll duplicate stitch over the centers of the open ones to make it match the other cross rows. I am particularly pleased with the hat band. 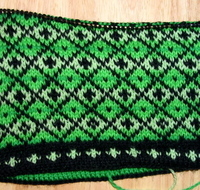 I worked 6 rows of the darkest green, added the black and worked a knit row, a purl row and then the light green cross pattern before knitting the cast on edge into the hat body. It is squishy and sharply defined. I haven't yet decided on what decrease pattern to use for the top and may wait for Saturday's Dulaan Knit In to see what the group thinks. My Library Board Open House is tonight, wish me luck. I was practicing my introductions and my closing remarks in the car this morning with BLING. At one point I accidentally said "I'd like to spank Murray" instead of "I'd like to thank Murray", now I'm terrified I'll say something even worse tonight. Nah, I'd stick with "spank." Just to check and see if anyone is paying attention. Beautiful, beautiful hat --- very proud of you!